About Geiger's Pest Services, Inc.
We are a family owned and operated business who specializes in Tent fumigation, with no sub-contracting. 100% veteran owned. What people say about Geiger's Pest Services, Inc. Prompt and professional, and the rare bug I find is already dead. The chemicals they use have no odor, and are safe for my pet. I have used their services since 2012. Always easy to work with, not easy with my erratic schedule. My house was swarming with termites. Thought I couldn't afford to have it tented. Then I called Geiger's. Almost half the price of others. This swarming season, nothing. Relieved of the disgusting bodies, wings and droppings of these invasive creatures. Signed up for the annual coverage and I won't have to deal with these bugs ever again. Thanx Geigers.... you made my life easier! Couldn’t be happier. Christina is proactive and thorough and very responsive. I’ve always had exceptional service from Geiger’s. Excellent service. Very attentive when listening to my concerns and followed up with thorough treatment. Thanks Chris! It’s the first I’ve used it. I've been a satisfied customer for over 5 years. Friendly, accommodating and reliable service. Christine is an A plus worker and quite knowledgeable. Thank you, quick response, professional service, great company. Explains everything and answers any questions asked with knowledge. Thank you Geiger's for the prompt response to a short window on our part of getting one of our buildings tented before classes start. Your fume staff was fast friendly and most importantly they are really really really good at what they do. We look forward to working with you in the future. -Facilities Department. Christina always does an excellent job. Great job. Satisfied with the results. Thanks. I had an animal scratching under our mobile home for several weeks. Christina and her associates kept coming back until every one was removed and there very hard to find enterence was blocked. They were tenacious and not afraid to go where no man had been! Thank you, Geiger’s Pest Control. Good service. On time for appointment. Professional employees. Would recommend to others. Always friendly, if any issues come up they respond very quickly. Very helpful, courteous, and prompt. Christine is the best! 😊. I have been with Geiger for many years and am very pleased with their services. They do inside and out every other month. Geiger's Pest Control Service is GREAT! They have keep us Bug-Free for years. I appreciate their service and their great attitude. Thanks for being so fabulous. I have been with Geiger's Pest Services for more than 20 years. They are courteous and respectful of my time. They always call ahead to see if I have any issues inside my house so they can make sure that I am home so they can get in and take care of it. They do such a great job of treating the outside of my home so we rarely have any inside problems. Over the years I have only had 4 service people which tells me that Geiger's is a great place to work too. Keep up the great work Geiger Team! Geiger’s Pest Control has been treating our property for over two years now. Happy to report that we’ve not had any bugs or pests. Amazing Staff & Technicians. They Do wonderful Work and are always Available. I would definitely recommend them. Very good job.. very professional.. I HAVE BEEN DEALING WITH GEIGER'S PEST SERVICE FOR MANY YEARS. I HAVE FOUND THEM TO BE VERY PROFESSIONAL AND EFFICIENT. THEY HAVE KEPT MY BUSINESS AND HOME PEST FREE. 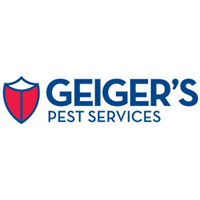 Geiger's Pest service was very professional and great to work with. They showed up when they said they would, gave us all the information we needed for the service and completed when they said thy would. Got the bugs out, has kept the bugs out for 9 years. Professional and courteous. On time. Day before notification of scheduled treatment. Quite satisfied. Geiger's provides the best service we ever found! They are on time and exceptionally organized! You can't go wrong with this company. Great company for pest control. I can't say enough about about my technician. She's the best! Reasonable price, pleasant to work with, flexible scheduling, timely. What more can you ask for? Great and courteous staff; their treatments are highly effective and also pet safe. Great job. We are very happy 😊 with your operation I am truly pleased. Very happy with our service. Always responsive, always willing to come by for a visit if we see anything, they have eliminated our ant problem. Originally contacted Geiger's to treat for tiny ants in the kitchen. They were successful but the ants came back in another area of the kitchen. Geiger came back out and retreated the new area (at no additional cost) and the ants are no longer a problem. I have signed up for their quarterly treatment and have had no bugs problems. They have done a good job and would highly recommend them. Always friendly and very responsive.